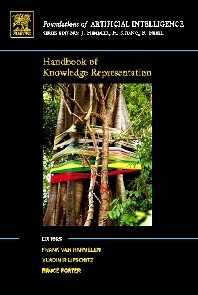 Handbook of Knowledge Representation describes the essential foundations of Knowledge Representation, which lies at the core of Artificial Intelligence (AI). The book provides an up-to-date review of twenty-five key topics in knowledge representation, written by the leaders of each field. It includes a tutorial background and cutting-edge developments, as well as applications of Knowledge Representation in a variety of AI systems. This handbook is organized into three parts. Part I deals with general methods in Knowledge Representation and reasoning and covers such topics as classical logic in Knowledge Representation; satisfiability solvers; description logics; constraint programming; conceptual graphs; nonmonotonic reasoning; model-based problem solving; and Bayesian networks. Part II focuses on classes of knowledge and specialized representations, with chapters on temporal representation and reasoning; spatial and physical reasoning; reasoning about knowledge and belief; temporal action logics; and nonmonotonic causal logic. Part III discusses Knowledge Representation in applications such as question answering; the semantic web; automated planning; cognitive robotics; multi-agent systems; and knowledge engineering. This book is an essential resource for graduate students, researchers, and practitioners in knowledge representation and AI.